open concept | Real people don't hire architects...? I always look longingly at projects like this one in Kanagawa, Japan. What could be more relevant for today’s life styles than a Modernist Box squeezed onto a tiny infill lot, positioned to take advantage of hillside views, and exactly the right size for commuting residents of first ring suburbs in metropolitan areas. Unfortunately, getting a project like this past US building and zoning departments, where relevance is irrelevant, is usually a major challenge. There are many architects that can do it, though. One only needs to ask? My first intro to a burger chute may have been in a Howard Johnsons restaurant which was next to a bowling alley where my dad was on a league. The view from the counter, where I usually found myself was of a hand attached to a hairy arm, presumably attached to the dirty apron in front of some stainless kitchen equipment. The infrared heat lamps mounted in the top of the chute cast a glow from the opening and the limited view made the scene slightly indecent, like a peep show. Many home owners, this one included, do not understand that hamburger chutes are all about what they hide and have nothing whatsoever to do with what they show. 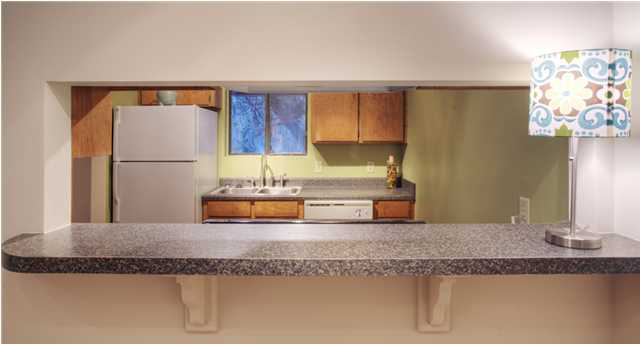 If, as I suspect, the goal here was an open concept, then the counter top would drop, the cabinets would go, and so would what was left of the wall. Any architect could tell you that compromise in design usually means a thing is either in or out, never both. TV buzzwords – in this case open concept – in the hands of an amateur often lead to terrible design. Indeed, if architects were on the project, there may never be another hamburger chute installed between a residential dining room and kitchen. This one would be good in a Denny’s. They come in all sizes and shapes and kitchen design places love them. More on these at some other time.